This vegan creamy spring pea asparagus pasta is oh-so-satisfying and packed with fresh, feel-good ingredients. 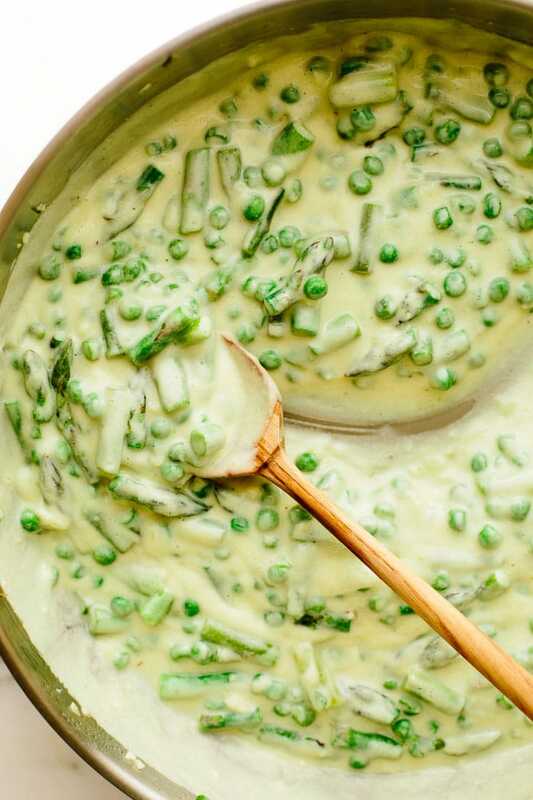 A simple, garlicky vegan cauliflower-cashew alfredo sauce is tossed with sautéed asparagus and peas to create a rich, veggie-dotted sauce. The sauce is then tossed with heaps of warm fettuccine. 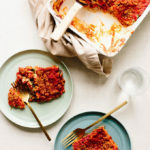 A sprinkle of vegan parmesan cheese is the finishing touch in this seasonal dish. Spring is in the air… or so we’d like to think here in Chicago. After a chilly, fairly snowy winter, I think we’re all eager for a bit of warmth and sunshine. And yet the chill persists. But just because the air is wintery doesn’t mean recipes have to be. 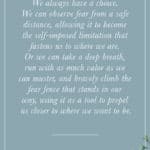 Drifting away are the days of hearty soups and stews. 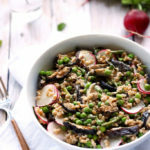 The much anticipated spring breeze is preemptively ushering in cravings for lighter, brighter dishes featuring fresh vegetables and all things green. Spring green that is. This vegan creamy spring pea asparagus pasta offers a fresh twist on the butternut squash pasta I shared earlier this year. 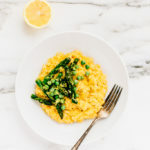 Crisp, vibrant asparagus and bright green peas take the place of roasted butternut squash, and an optional finishing of lemon zest lends brightness to balance out the rich and creamy cashew-cauliflower alfredo sauce. To make this spring pasta dish, you’ll start by boiling 12 ounces of fettuccine pasta (regular or gluten-free). As the pasta cooks, you’ll get to work on the sauce. 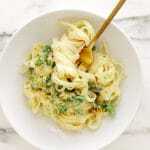 To make this simple cauliflower-cashew alfredo sauce, boil two cups of fresh (or frozen) cauliflower florets. 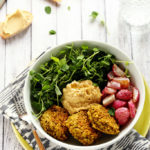 Once the florets are fork-tender, add them to a blender along with filtered water, raw cashews nutritional yeast flakes, apple cider vinegar, sea salt, and freshly ground black pepper. 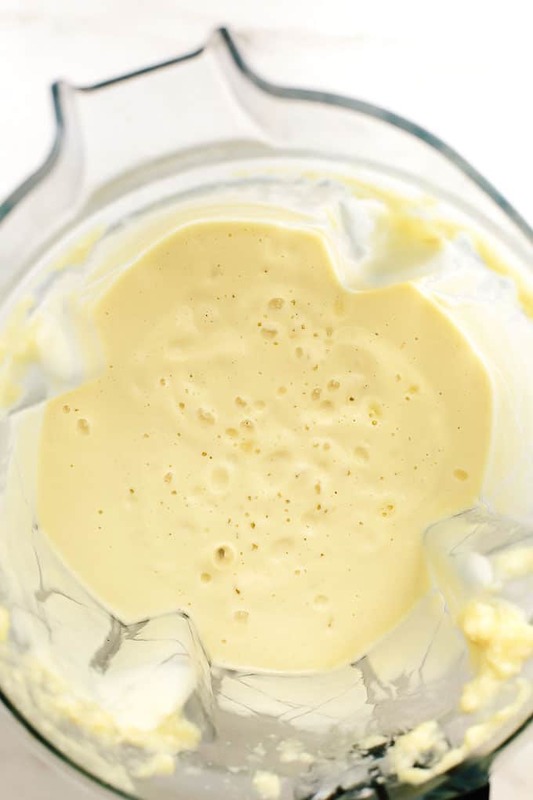 Blend on high for two minutes, or until you have a super smooth and creamy sauce. 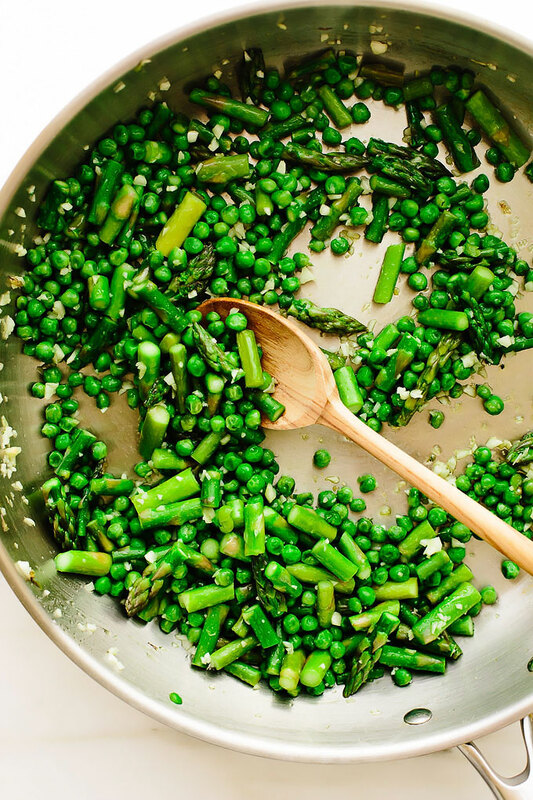 Then, add one bunch of trimmed and diced asparagus to a large sauté pan along with a cup and a half of frozen peas and a drizzle of olive oil. 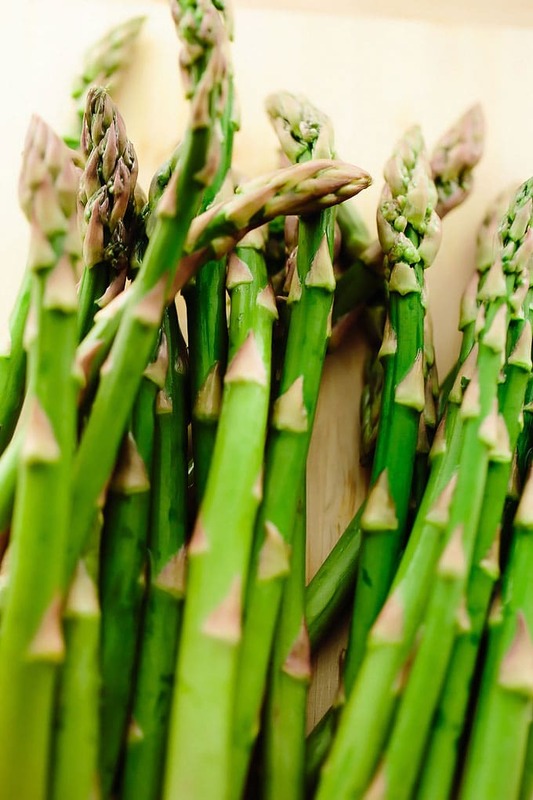 Sauté the vegetables for about five minutes, or until the asparagus becomes firm-tender. Then, stir in six cloves of minced garlic and continue to sauté for another minute or two. Once the garlic has softened and mellowed, stir in the cauliflower-cashew sauce and simmer for just a minute, or until the sauce begins to thicken ever so slightly. Next, add the cooked fettuccine to the pan and toss to coat. If you’d like, you can thin the sauce with a bit of reserved pasta water. Then, taste and generously season with sea salt and black pepper. Divide the pasta amongst roomy bowls and top with a generous sprinkle of vegan parmesan. 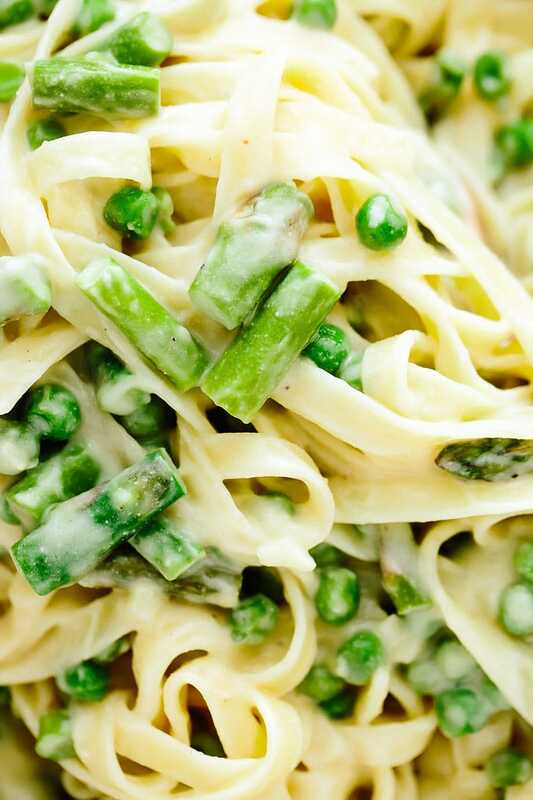 This vegan creamy spring pea asparagus pasta is rich yet balanced and bright. Plus, it packs a nourishing punch of vitamin k, folate, b6, b1, manganese, and copper. Have your creamy pasta and feel good, too! 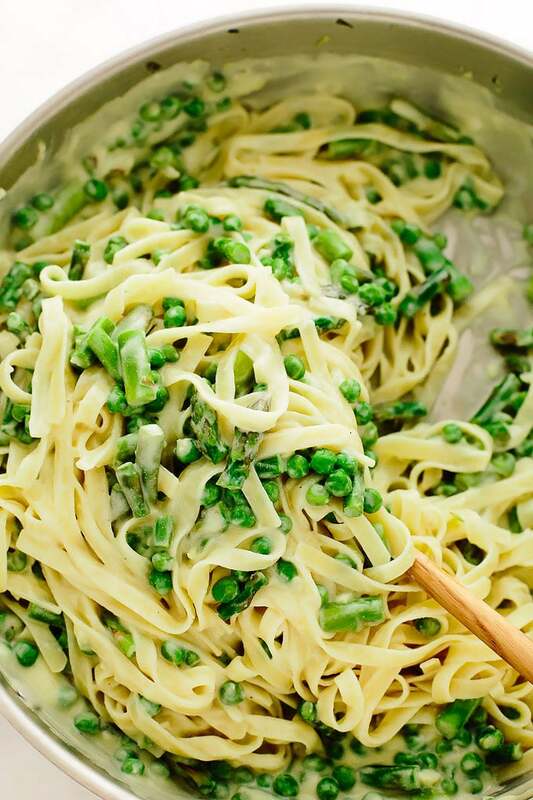 This vegan creamy spring pea asparagus pasta is oh-so-satisfying and packed with fresh spring feel-good ingredients. 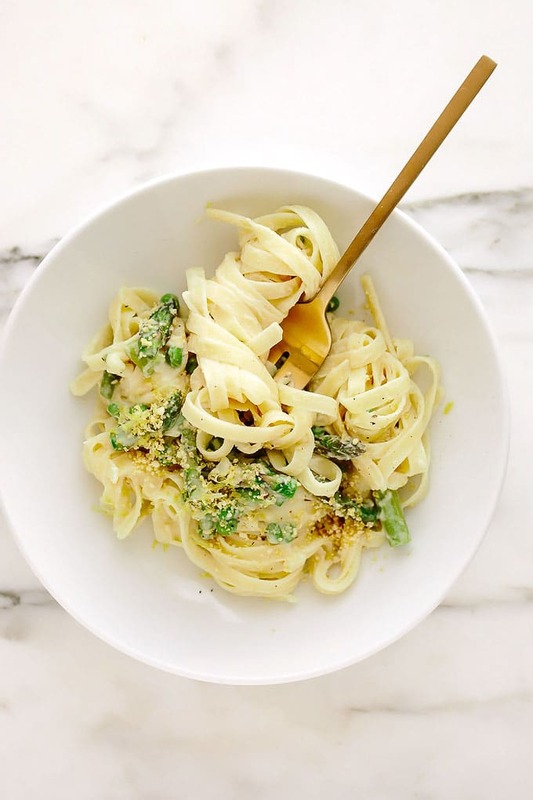 A simple, garlicky vegan cauliflower-cashew alfredo sauce is tossed with sautéed asparagus and peas to create a rich, veggie-dotted sauce. The sauce is then tossed with heaps of warm fettuccine. 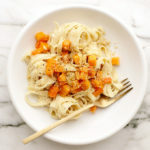 A sprinkle of vegan parmesan cheese is the finishing touch in this seasonal dish. Bring a large pot of water to a boil and add 1 tablespoon sea salt. Add the pasta and cook according to package instructions (you want the pasta to have a nice al dente bite to it). Drain the pasta, reserving 1 cup of the cooking water, and set aside. Meanwhile, bring a medium pot of water to a boil. Add the cauliflower florets and boil for 7 minutes, or until very fork-tender. Strain off the water. 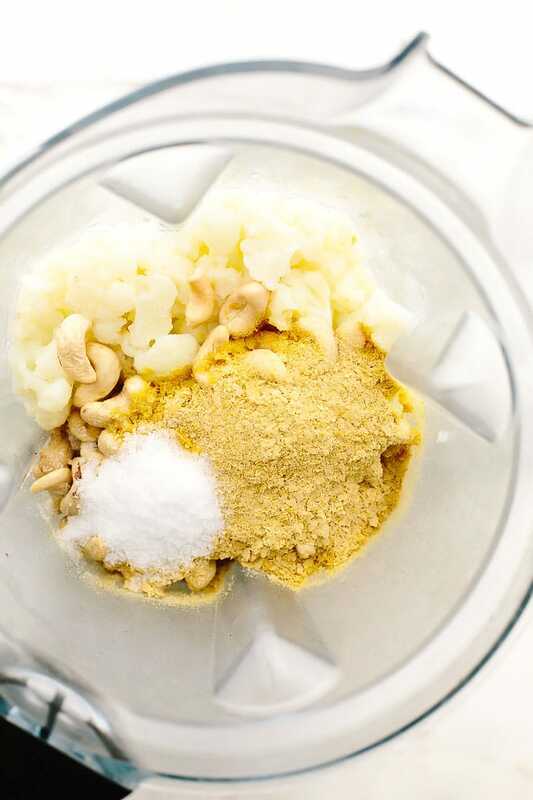 Add the boiled cauliflower florets, filtered water, cashews, nutritional yeast, vinegar, 1 teaspoon sea salt, and black pepper to a blender (do not use a food processor). 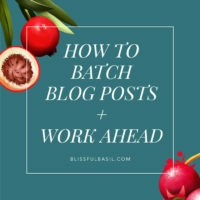 Blend on high for 2 minutes, or until completely smooth and creamy. Set within reach of the stove. Heat the olive oil in a large sauté pan over low heat. Add the asparagus and peas, and cook for 5 minutes, or until the vegetables just begin to soften. Add the garlic and continue to cook for 1 minutes, or until soft and fragrant. Stir in the cauliflower sauce, increase the heat to medium, and simmer for 2 minutes, or until hot and bubbly. Taste and generously season with more sea salt and black pepper, if desired. 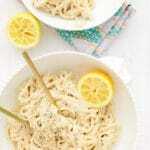 Divide the pasta between bowls and top with the parmesan and lemon zest (if using). Serve immediately. And added onion mushroom and cherry tomatoes. So glad you’re enjoying the recipe, Angela!! Thanks for taking time out of your day to come back and share your thoughts. Means so much! 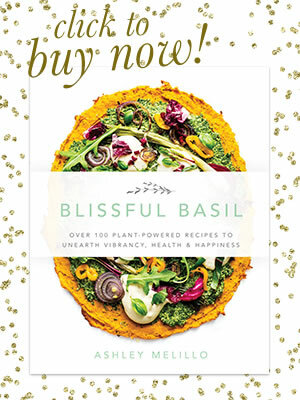 Hi, I have been vegan for over 20 years and have more cookbooks and ideas than I will ever need! 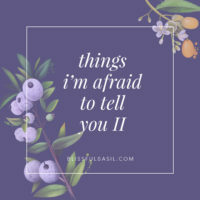 However, I just want to say I started following your blog a few weeks ago and I really appreciate your recipes and ideas. Your palate is similar to mine and I love your take on a lot of ideas and flavour combinations. This is another excellent dish that has hit the spot. Look forward to trying this soon! This was an absolute hit, will be in rotation! So glad you’re enjoying the recipe, Iris! Thanks for taking the time to come back and share your thoughts and rating—means so much. This was fantastic! Light, but creamy! My husband and two teenagers loved it and cleaned their plates! 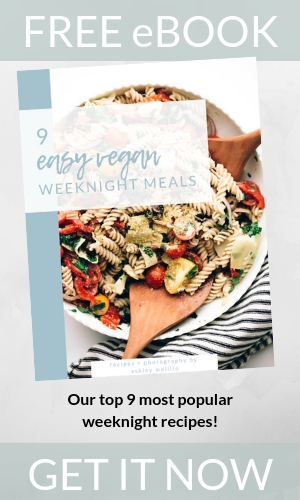 I ate mine with zucchini noodles instead of pasta and it was delicious! Thanks for another great recipe! So happy to hear you and your family enjoyed the recipe, Luann! Especially two teenagers—such a great compliment. Thanks for taking time out of your day to come back and share. Means so much.